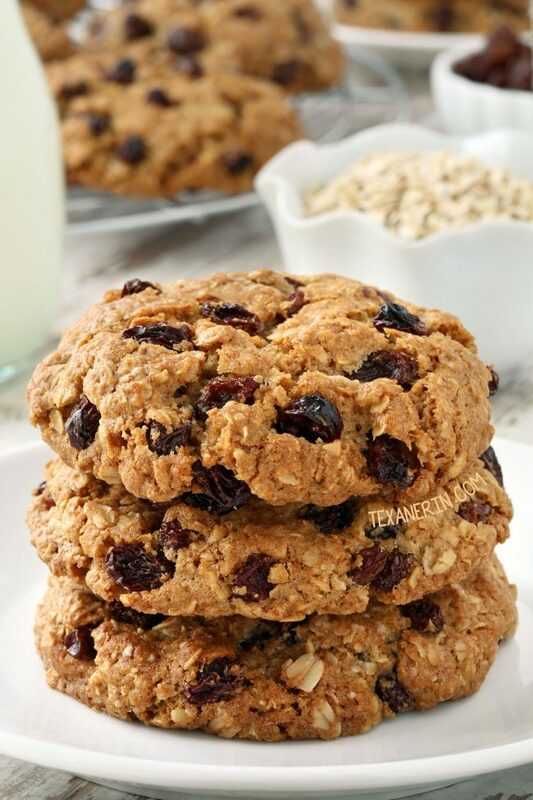 The best gluten-free oatmeal cookies you’ll ever have! They’re soft, thick, and chewy and nobody will know that they’re gluten-free and dairy-free. Can also be made with whole wheat or all-purpose flour. With a vegan option. I’m working on a more nutritious grain-free oatmeal raisin cookie recipe, but until that happens, here’s my not-so-healthy gluten-free version! Update: I now have a recipe for paleo oatmeal cookies that people are loving! And I have a version that you don’t even need an oven for! These no-bake oatmeal cookies are seriously so, so good! If you don’t need these oatmeal cookies to be gluten-free, you can use whole wheat, white whole wheat or whole spelt flour in place of the first four ingredients (rice flour through xanthan gum). I also just tested these cookies with all-purpose flour and that works just as well! I added some chocolate chips to the dough of a few cookies and placed some more on top after baking, but we actually preferred the chocolate-less version! Crazy but true. I think my issue is that I’m just not a huge lover of cinnamon + chocolate together. If you recognize these cookies, it’s because I posted the original whole wheat version three years ago. I think about 4 people a month look at that recipe so I figured the gluten-free version needed their own post! This gluten-free version tastes exactly the same and are even a little thicker than the whole wheat / all-purpose version. There are lots of great reviews on that post so go check them out if you’re curious. 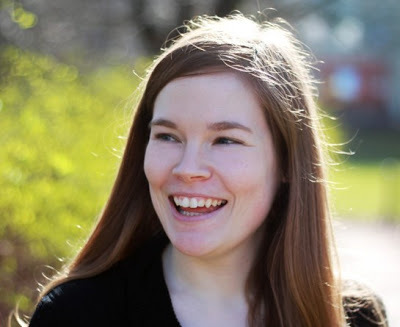 One reader, Lauren, who has made lots of my recipes declared them the best recipe on my blog. And I agree that they’re in the top 5! The only thing I don’t like is the flours I used. I love the end result but the flours are totally nutritionally void. At least there are oats? ;) But these cookies are so delicious I honestly don’t care about the lack of nutrition here. I don’t think you will either after the first bite! If you don't need these to be gluten-free, you can use 1 1/2 cups whole wheat flour or all-purpose flour in place of the first four ingredients. Form the dough into 77-gram balls, about two inches or slightly over 1/4 cup in size, and place 4" apart on the prepared baking sheet. Press the balls down slightly with the palm of your hand. If your dough is too soft to roll into balls, refrigerate for about 30 minutes or until scoopable. Bake for 13-17 minutes or until the middle appears to be set and the cookies have evenly browned. They'll still be very soft straight from the oven but firm up as they cool and sit for an hour or so. I used refined coconut oil which doesn't have any coconut taste. If you use unrefined coconut oil, these cookies will likely have some coconut flavor to them. 79 comments on “Gluten-free Oatmeal Cookies (vegan option)” — Add one! I notice that you use tapioka flour. I wonder if you mean Tapioka starch. Tapioka flour (best known as mokaf or modified tapioka) is a whole different structure flour – it is one of the best gluten free flour option, however it is hard to find in north america (I only found them in high end health store) and very expensive ($40/2pound). It is one of the newly developed flour from Indonesia and very cheap here ($2/kg). Hello! I’am from South Korea! I want to say “Thank you”.!! Your recipe was so amazing,crunch and yummy!!! I’ve tried to make some oatmeal cookies four times, But it wasn’t good… :( Now, I’ve found a great recipe here !! Hi, thank you so much for sharing this recipe! I can’t eat grains but want to make this for my husband for Valentine’s Day. If I cut the sugar down to 3/4 cup, do you think it’d be sweet enough? My guess is for 16 large cookies, it’d work. We have to watch his sugar intake. Just wondered if the recipe as baked makes pretty sweet cookies. Thank you again! I’m so very sorry for just now seeing your question. :( If you reduce the sugar by almost half, the cakes would then be cakey and not chewy. They’re not overly sweet as written but maybe you could reduce it to 1 cup. I also have a grain-free version linked to in the post if that helps you! If I use wheat flour instead do I still need the gum for the recipe? These look really good. Nope! There’s a note about that in the paragraph above the second picture. :) Enjoy! I am making these cookies for the 2nd time in 2 weeks. I waited until today to make them again because I ate them all myself the 1st time. I just put them into the oven and I can’t wait! Finding a delicious gluten and dairy free cookie is wonderful. The absolutely perfect texture is an added bonus! Hi Christina! You’re welcome. :) I’m thrilled that you liked the cookies so much! It was very practical of you to wait a bit again before making them. I have the same eat-the-entire-batch-without-sharing issue. :D Thanks a bunch for your comment! Erin-Thank you so much for sharing this recipe! I just made these cookies and I’m over the moon! THEY ARE DELICIOUS!!! I can’t tell you how many times I’ve tried making a gluten free and dairy free dessert and they have tasted awful. These cookies are honestly better than ones loaded with butter and gluten. Thank you again!!! Haha. I’m with you on the GF / DF desserts often being awful! Sooo many bad recipes out there. Hopefully you can find some more recipes on my site that you’ll like just as much. :) Thanks a bunch for your comment! Erin, We have a new diagnosis in the household of Celiac Disease so am scrambling to find his favorite foods but without gluten. After dumping the recipe from Martha Stewart because it was atrocious tasting, I found yours and the recipe is really good. The ‘cookie monster’ is happy he can now enjoy his favorite treat. Hi Marji! 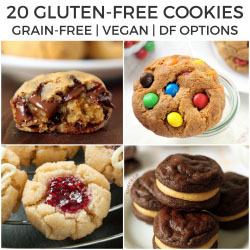 I’m happy you found a good gluten-free cookie recipe that your cookie monster can enjoy. :) There are definitely some bad GF recipes out there! Thanks for your feedback and sorry for the slow reply! Just got home from hospital after having a baby (it was a long stay!). How many cookies does this recipe make if I follow directions of 1/4 c+ for each cookie? I overcooked mine a bit but even so, these are amazing! Thanks for the recipe. You’re welcome! I hope you’ll enjoy the not overbaked version even more next time. :) Thanks for your comment! I want to make these but I am going to use regular flour Because I don’t have those other ones and I don’t mind gluten I hope it will work I like all the ingredients , very healthy. Thank you. Like a lot other foods I looked at also, I be back. I loved the, I used butter and they came out perfectly I changed a few things but that’s my habit with new recipes thank you!!! You’re welcome! So happy that they came out well for you. :) Thanks for your comment and so sorry I just now saw it! I made these… they are great! Very tasty and huge for sure. Next time I make them I may try to yield 32 cookies to cut back on the serving size. Very very tasty though!! Yay! So happy that you liked them. I have to admit that they are a bit big. ;) Thanks so much for your comment! Oh and i also used a gluten free flour pre blend and they still came out great. Just enjoyed my first batch. I put a tablespoon of ghee in for flavor- Delish! Sooooo goood! Best oatmeal cookies I ever had. I used about 3/4cup of rice flour and added gluten free oatmeal flour for the remaining 1/4c And also used gf oatmeal flour instead of potato strach And tapioca. Skipped the gum too And used butter. Big, puffy, chewy. Yummy! Haha. Wow! You created your very own recipe. :D I’m so happy that they came out well! Thanks a bunch for sharing your changes. I’m sure it’ll be a big help to others who are wondering about subs. Thanks for your feedback! These are amazing! Thank you for this recipe. I don’t write recipe review, EVER. However, since I have been told of numerous food allergies I have, baked goods are basically out of my life, and I have a bit of a love affair with sweets. These are THE BEST STINKIN’ cookies I have had in 2 years that won’t make me sick!! Thank you SO MUCH for this amazing blog. I have already opened three other recipes that I intend on trying this week. It’s fun to bake healthy, but when you don’t have any other option and you stumble across something this delicious, it almost makes you forget what you’re missing. BTW – these cookies are perfect. Just amazing, simply delicious. I used coconut shortening because I didn’t have enough oil in the house at the moment, and they are amazing. It just took a while longer to cook. WOw, just made these. THought theyd be lumpy and stodgy. But not at all. Very delicious indeed :-)and enjoyed them even more as they are gluten free! Clarification- I’ve made cookies w just ground oats before, I know it can be done, I’m wondering if I’ll still get the chewy texture. (I don’t remember the texture from last year’s baking. I love chewy! I’ve also made cookies with just oat flour (and they were delicious!) but unfortunately, oat flour isn’t a sub for all-purpose flour or the combination of flours I used in this recipe. Sorry about that! What about just using ground oats for the flour? i would like to know if you buy white rice flour that has potato starch, tapioca flour and xanthan gum shown in the ingredients can you use that and then add the baking soda, baking powder, salt and cinnamon? Does it matter which kind of rice flour you use? Sweet White Rice or White Rice or Brown Rice? Thanks for your help. My daughter has recently been diagnosed with Celiac and she loves Oatmeal cookies. I have Brown rice flour that is also mentioned as “sticky” on the package, and son’t have Xantan Gum. Do you think it could work If I don’t change the other ingredients? I made these last night – they are delicious. I used one cup of coconut sugar and 1/3 cup of sugar replacer. I also replaced the tapioca flour with coconut flour (on a weight basis) because I don’t like the taste of tapioca flour. Next time I make them I will substitute some of the rolled oats with pecans and sunflower seeds. These were a huge hit at our small group, then I made them for my college age daughter and she and her friends absolutely loved them! I made them with whole wheat (King Arthur’s white whole wheat) as I didn’t have the other ingredient. Planning to make them for my son’s high school grad party this Saturday. Easy to make ahead and to serve outside! Awesome! I’m super happy to hear that everyone you’ve made them for has enjoyed them. And congratulations to your son! I hope his friends will enjoy the cookies, too. :) Thanks for your feedback! thank you again for another hit recipe! I did it for my daughter’s pool party and it was my first time. All the moms and the kids enjoyed it! Mine did not look so good as yours, but they were delicious! Thank you again. Hi Arlete! I’m happy to hear that they were enjoyed at the party. You know what’s weird is that I’ve made these several times and they often look a little different. And I have no idea why! Sometimes they’re really nice and thick like the ones in these pictures and every now and then they’re not as thick. I wish I knew what the variable was! But at least they’re always delicious. ;) Thanks a bunch for your comment! Oatmeal Raisin are one of my favorite cookies. I am not familiar with GF baking, 3 of the ingredients are foreign to me but they sure sound & look spot on! I can’t believe these are gluten free! They’re perfect! Wow, these look awesome! 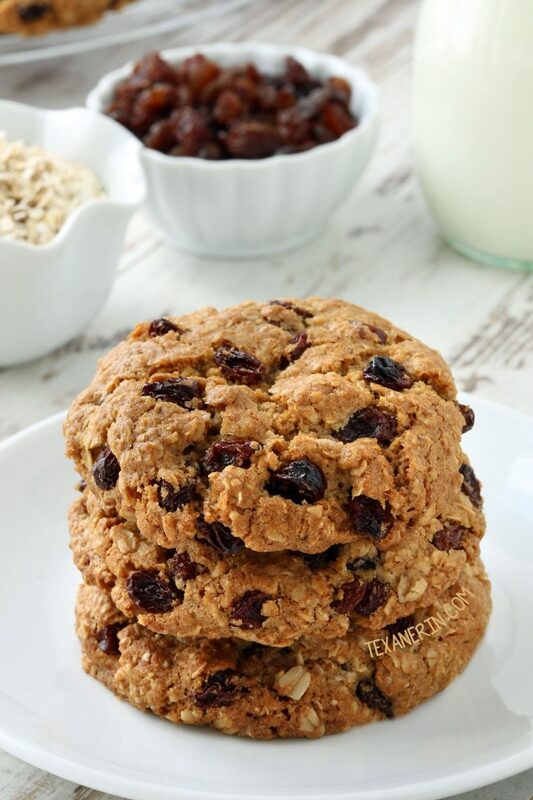 I’ve always loved oatmeal raisin cookies, I need to try this GF version! I hope you will and that you’ll love them! Yes, these really do look like the BEST ever Oatmeal Cookies! They look so chewy too, I can’t wait to make them! My Mom is spending the weekend with me this weekend, and she happens to be gluten-free. Totally going to surprise her with these! I love thick and chewy!! I need to try these for the GF,DF folks. They look wonderful! 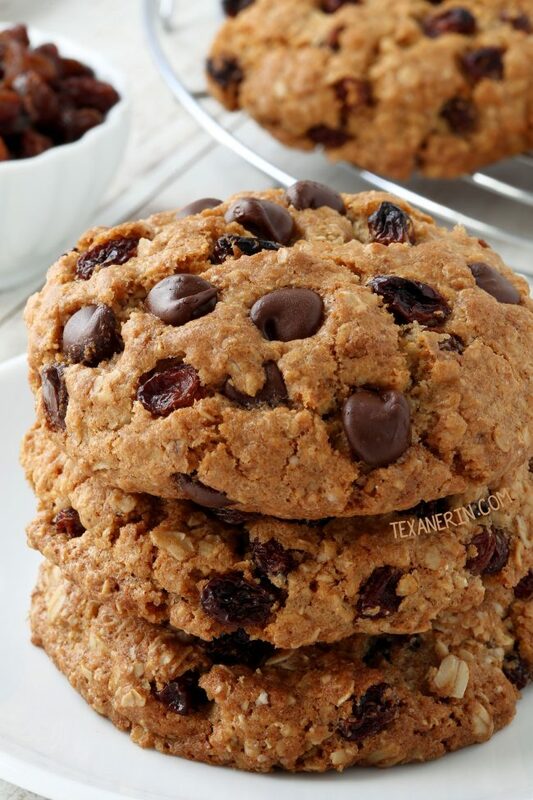 I love that they are completely full of oats, raisins and chocolate chips! Such a great looking cookie! Oatmeal cookies are an ultimate comfort food for me – I love them when done right (and these look incredibly right)! I love how thick they are…just like a good oatmeal cookie should be. Good question! ;) I hope you got the chance to try them out!